2 level workbench with 8mm thick chipboard . 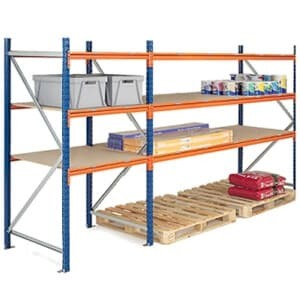 Each level can hold up to up to 300kg UDL. Adjustable shelves allow for a variety of workbench solutions. Easy assembly – takes just minutes. (H)920 x (W)1500mm x (D)600mm. 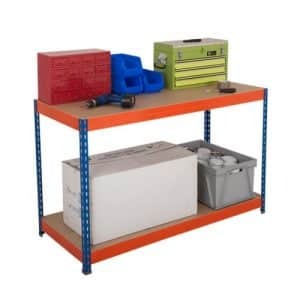 Our workbenches will suit any task that you need them for. 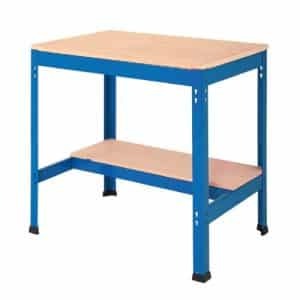 We have a range of work benches to choose from. 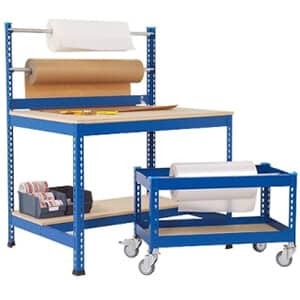 You can select a heavy duty workbench, one that is mobile or even extra heavy duty benches. This means that you can put it in any environment and you do not need to worry about how well it will survive! 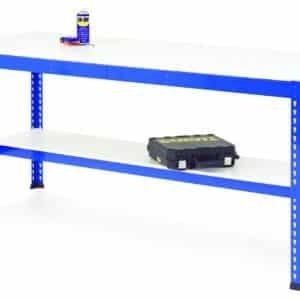 You can choose a workbench with a lower shelf that you may stand up at or one with a t-bar which would be comfortable for sitting at. As a compromise some of the workbenches have a half shelf lower down so you can still sit comfortably but still have storage room below the main top. One design has drawers to one side that you can use to keep things clean and well organised. The mobile designs have wheels so that they can easily be moved to the place where they are needed or tucked out of the way when not needed. 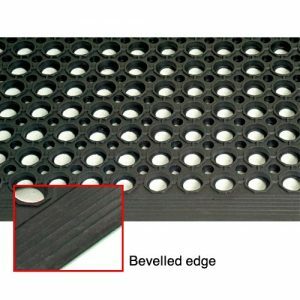 Accessories are also available such as an anti-fatigue mat and workbench matting. The items available are all good quality but also cheap. This means that you will be able to get really good value from money from any of the designs that you choose. However, if you know that it will get a lot of use then go for the heavy duty or extra heavy duty as these will stand up to the job more. You can choose different colours in most of them as well as different options for what the shelving is made of in some designs as well. This means that you can select the perfect work bench to fit in with your working environment and you do not have to overpay in order to do so. Therefore it is well worth a look at the full range. 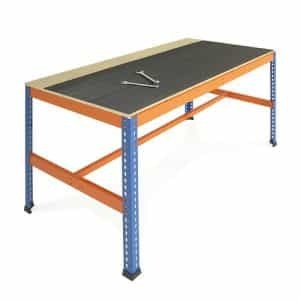 If you are looking for workshop benches then we have a great range here to choose form. You will find a selection of different styles and designs that will enable you to choose the perfect item for you. 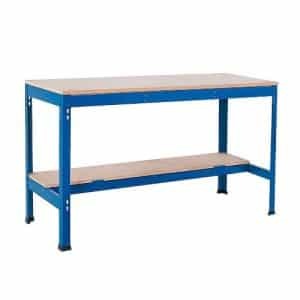 Our heavy duty workbenches come in different styles. 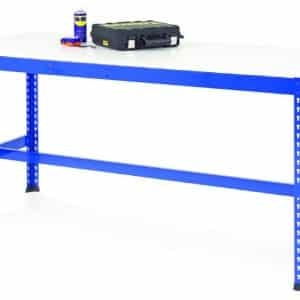 There is a heavy duty workbench with lower shelf which is perfect to give you extra storage space and so things can be kept well organised. 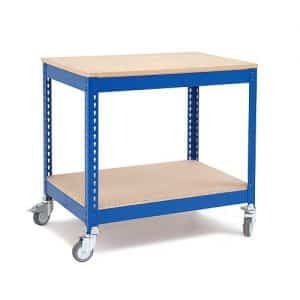 For something a bit cheaper there is a heavy duty workbench with a T-bar support underneath. This means that it can take weight but there is no shelf underneath giving more leg room for those who need it and space to stack things on the floor underneath. 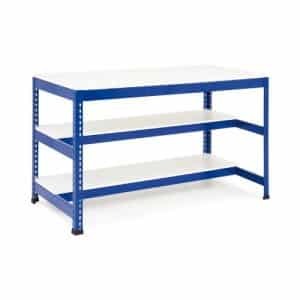 For a more comfortable sitting arrangement there is the option of a heavy duty workbench with lower half shelf. The shelf allows some extra storage space but also gives room for knees and legs if you are sitting at the bench. 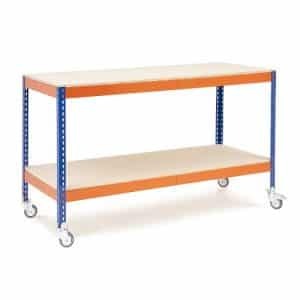 For more stacking space there is a version of this heavy duty workbench with two lower half shelves. If you want something stronger there is a range of extra heavy workbenches. There is a simple design with a half shelf under so you can sit comfortably at the bench. There is one with a t-bar design with drawers to one side. 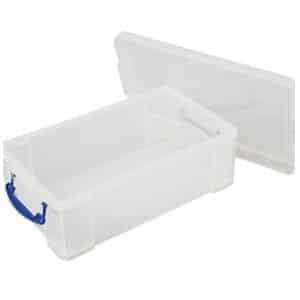 These are plastic and will allow you to easily store items that you need but keep them well organised and clean. 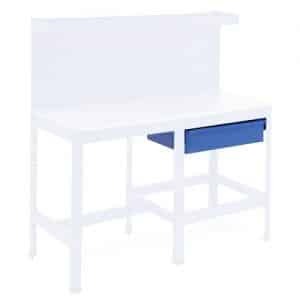 If you want something more compact there is a extra heavy duty compact workbench which has a lower half shelf but is not so long so it fits in a smaller space. There are also mobile options which have four wheels on the bottom. 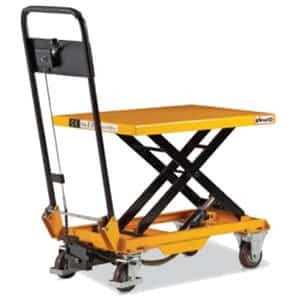 The mobile workbench has a lower shelf and can be easily wheeled around but with the safety of a brake. 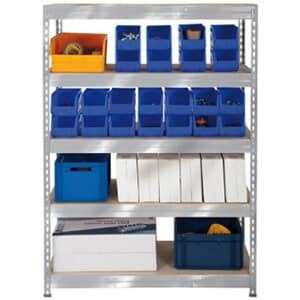 For something smaller there is a mobile tool station which has as lower shelf as well and also has brakes for safety. There are also accessories available if you need them such as an anti-fatigue mat to go under workstations where people are standing a lot. It is also possible to purchase workbench matting to give a non-slip surface for working.